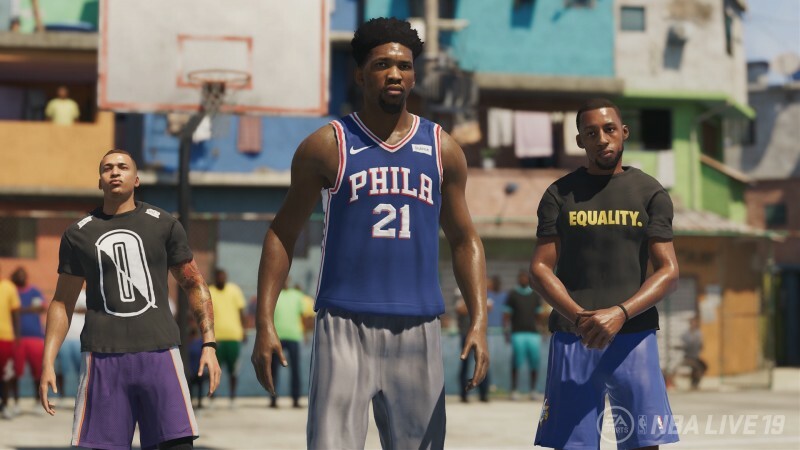 After nearly a decade of struggling to field a competitive basketball game, last year EA Sports finally put some proper pieces into place that signal a better future for the NBA Live franchise. 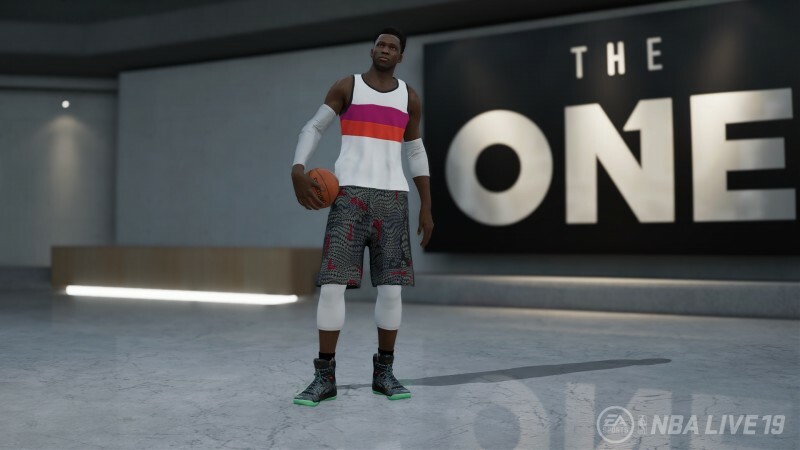 NBA Live 19 looks to continue the upward trajectory with some needed changes to the on-court action and some interesting additions to The One mode. Here's everything we learned from playing a couple games and chatting with creative director Connor Dougan. 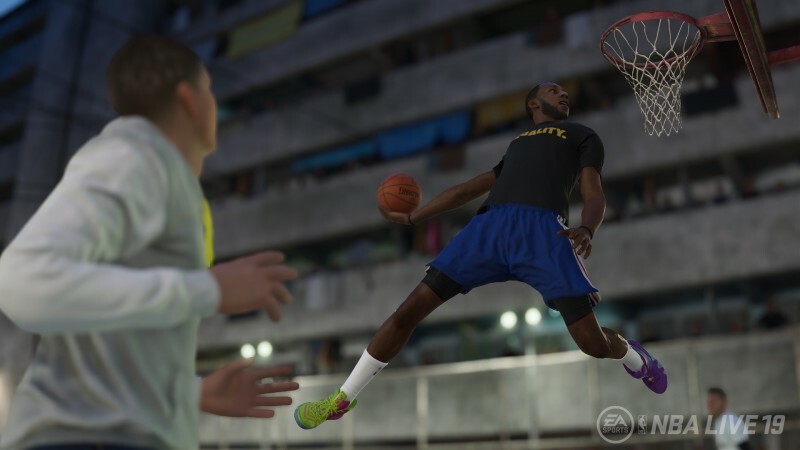 NBA Live 19 introduces the Real Player Motion technology recently seen in EA Sports titles like FIFA 18 and UFC 3, which EA Tiburon believes has resulted in more realistic player animations. "When you compared us to 2K in the past it just wouldn't feel as smooth; we had this kind of stiffness," Dougan says. "With Real Player Motion and changing our player skeleton and models, we feel we have a nice jump in animation quality." 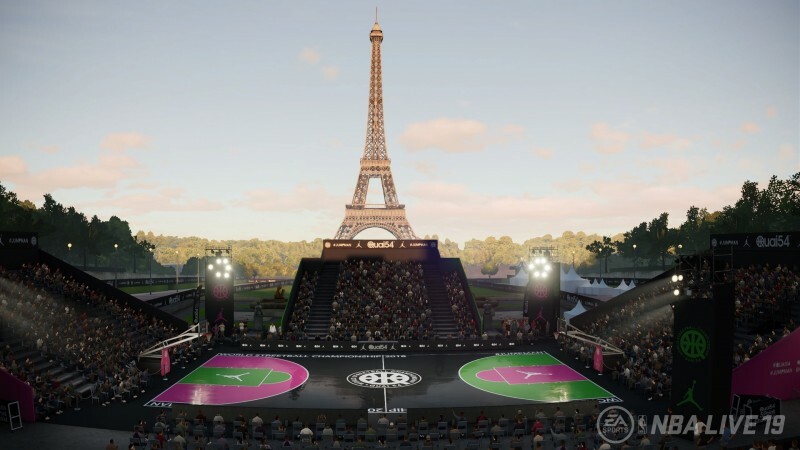 Some of the new animations I saw in gameplay included new contested dunks, players fighting through screens during pick and rolls, and way more physicality off the ball. The new animation system comes hand-in-hand with reworked dribbling. Expect to see many more signature animations like LeBron James puffing out his chest and James Harden coming up the court with more relaxed body language and his standard crossovers. You can also pull off basic moves by flicking the left analog stick; you no longer always need to use the right analog stick, but if you do expect to find more moves for star players than before. EA also did a lot of "live environment" work to make the players better interact with the world around them. Expect to see players crashing into the stanchion, diving into the crowd, taunting one another, and even exchanging pleasantries with the opposing team's bench along the sidelines. Overhauled triple-threat controls integrate new jab steps and a new pump fake system. 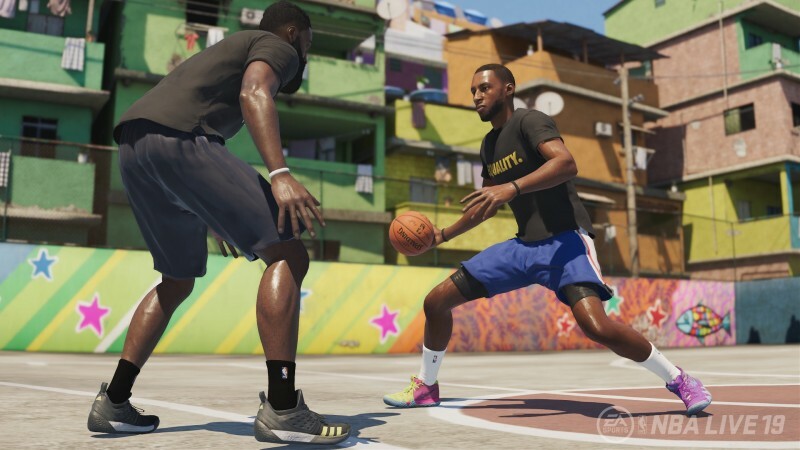 Building off last year's one-on-one gameplay, EA is bringing the cat and mouse game to off-ball interactions as well, which should hopefully make playing in space more engaging. You use the left trigger to engage in off-ball defense, which tries to slow down your mark. The offensive player has counters like V-cuts and L-cuts to break off your defending. The reworked shooting system now includes varied jump heights and release points for different players, which should make it feel more authentic. Last year's CPU A.I. had problems feeding star players. EA says this year's dynamic gameplay A.I. does a better job of recognizing when a star is heading up and will continue to feed a hot hand. Stars will strong personalities will start to talk trash when firing on all cylinders. You can now switch to take control of an off-ball player in versus by holding the RB and flicking the analog stick toward the player you want to control. You can triple-tap the steal button to perform a hard foul when you need to stop the clock. The transition game also gets a jump in CPU A.I. Expect to see players on the break cut to the hoop stronger and the trailing wing players space out for open threes. If you own a player by continually scoring on them or breaking their ankle, you can affect their mentality. When a player is adversely affected, their ratings take a hit. 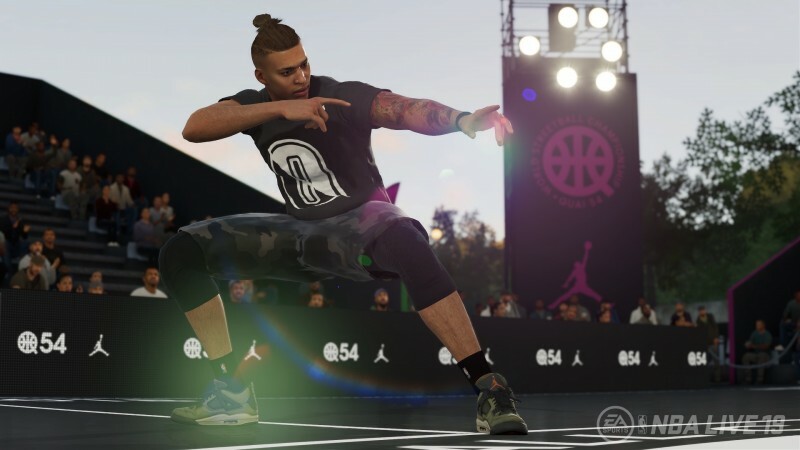 To mix up replays, NBA Live 19 introduces cell phone cutaway highlights, where the perspective shifts to a person in the crowd capturing the play of note. Last year, you played as a former blue-chip college prospect trying to overcome a horrific injury. This year you start earlier in the journey as a hot high school prospect. Rather than go to college, you try to build your rep on the street courts. Eventually if you earn enough prestige, you get invited to a pre-draft camp where you can prove your mettle by playing in a few prospect games. During your rise to stardom, influencers and broadcasters will show off your highlights. The dialogue system returns from last year, but it leans more heavily toward meaningful choices this time. Expect to see more hairstyles, tattoos, and clothing options this year. Cosmetics are no longer locked behind loot crates. You can buy what you want when you want. The progression system is similar to last year, but adds a new wrinkle with the icon abilities. These abilities give you branching choices that let you to have more say over what type of specialist you are. Say you choose shot blocking as your icon ability. Eventually, you may be presented with a choice. For instance, do you want a higher percentage of success for each shot block, or extend the radius where your shot block is effective? EA has added several new traits to the progression as well. EA realizes there were too many ball hogs in online team play last year, so it reworked the grading system to give players more points for teamplay and less for being selfish. If you take a bad shot, you will get hit with a -10. Doing it again knocks you another 20 points, and it continues to scale the punishment so people have way less incentive to try to shoot out of slumps. Last year in The One's Street mode you went to different venues to play with random collections of players. This year you can custom build your squad by earning players as you rack up Ws. As you beat different teams, you can add star players to your lineup that can be swapped out as you see fit. The players you start with are largely scrubs and low-level NBA benchwarmers, but you can eventually earn stars and even NBA legends. 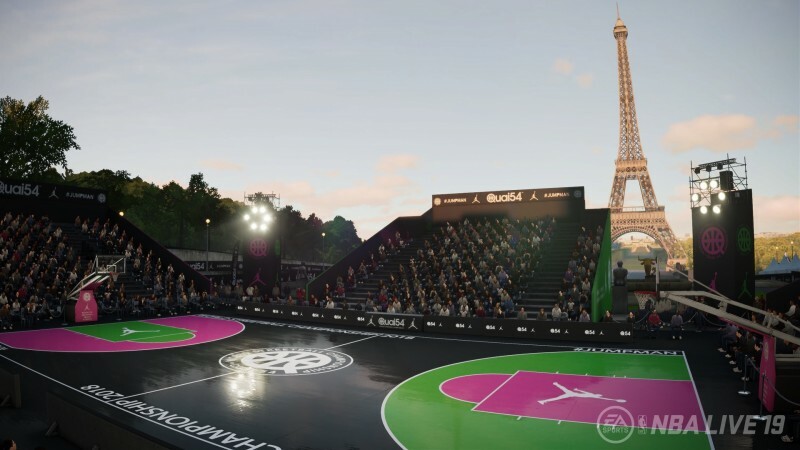 Your streetball endeavors take you to new courts around the world, including France, Brazil, and the Phillippines. Expect a few new North American courts as well. 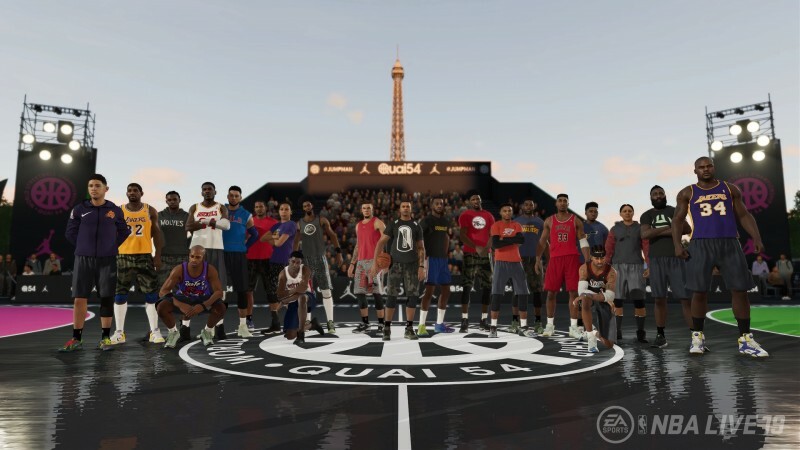 Many of the live events in NBA Live 19 will be centered on earning new squad players who are only available for a limited time. 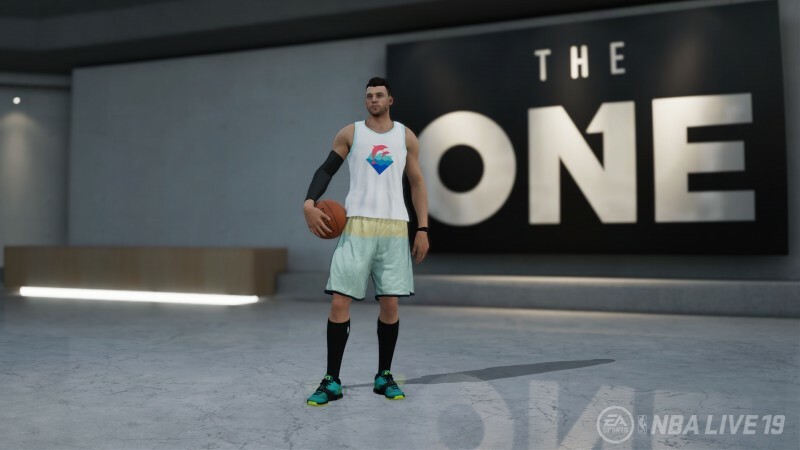 We still have a lot to learn about how EA Tiburon plans to improve the Ultimate Team and Franchise Mode experieince of NBA Live 19. Stay tuned in the coming months as we dive deeper into the title. 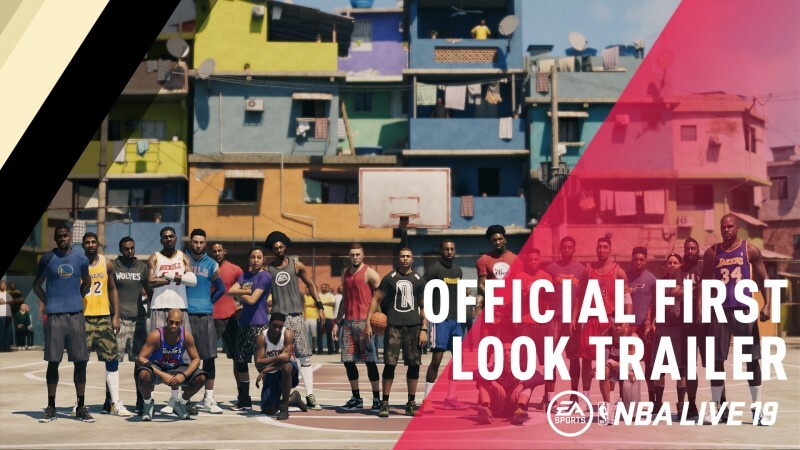 The free NBA Live 19 demo releases on August 24 on PlayStation 4 and Xbox One. The First Trial starts on September 3 on Xbox One, and final release drops for both consoles on September 7.